I was so excited when I got this can in the mail. Oden’s extreme Cold, White Dry portion. Wow! Can it get better then this? I've always loved the buzz you get from Oden’s extreme regular portions even though I haven’t had it in a while since it’s mega-strong. Another reason is that I don’t really enjoy the regular drippy portions. So this is really exciting news people! 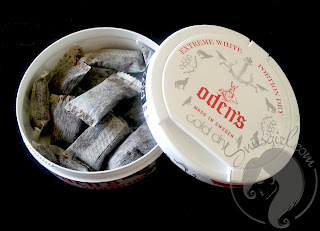 Oden’s Extreme Cold in a dry white portion. Couldn’t wait to try it. 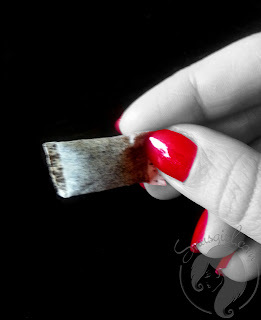 The portions looks really fresh and clean and they are really fully packed with snus. Some portions from other brands can feel really empty, like it’s just a bag with a little little amount of snus inside. This is the real deal! They are slightly on the edge of being too big for my small little mouth but it’s OK. Portion 1: When I first put the portion in I felt this huge burn under my lip. The burn that I’ve become so addicted to. I had the first portion in for like 5 minutes then I had to take it out. It felt like a powerful river running through my head and I got this great nicotine buzz I’ve actually never felt in that way before. When I described it to my husband he told me to spit it out so I wouldn’t become sick. This is strong stuff! However now 2 minutes after I spit it out I really crave for a new one. I want this feeling again! I I have to wait a while before trying the next one otherwise I’ll get a nicotine overdose so big it will ruin my day I guess so I’ll be patient. Portion 2: I Had a late lunch and then I decided to hit it again. I put in my second portion and one minute after I noticed my fingers started shaking. My head feels all cloudy and my body feels really heavy now. Again I have to say, the burn is just wonderful and the mint flavor is kind of discreet and nice. When I lick the portion a bit with my tongue the flavor really comes out nice. OMG this is STRONG! I get a great nicotine buzz from this snus. Some portions later I can definitely say this is one of my favorite snuses. I want this can to last forever and ever and ever, but I’m almost out so I gotta order some more. The can is really nice. It has this cool hard-rock-viking feeling to it but at the same time it’s nice and clean. Goes well with my red nails :). I went to Rock Music school when I was 19, I would have loved to have this can then, but at that time I thought it was so cool to smoke those nasty cigarettes. Definitely one of the best snuses I've tried. Be careful though, it is very strong. Northerner has got this new Oden's product in their US warehouse now so guess it's being shipped all over the world. If you try it, let me know what you think! I just have to say it again: I love this snus!